Jazmine contacted the studio to inquire about all of the sessions we offer! Caroline (our full time studio manager) spent some time on the phone with her answering her questions and learning about what she envisioned for her maternity session. 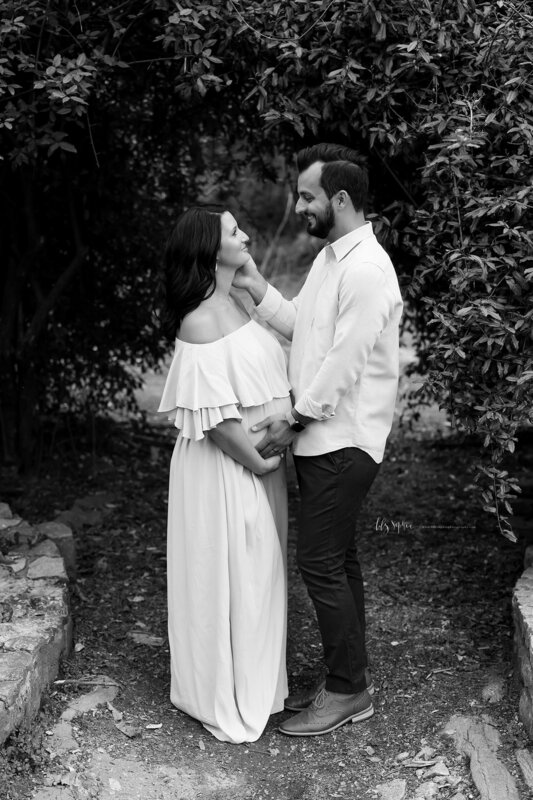 Jazmine chose to book both maternity and newborn with us, and wasn’t sure if she wanted to have her maternity session in the park or gardens location. After looking through our Instagram feed and reading through the blog, she fell in love with the gardens. The gardens are a perfect choice for those who live in intown Atlanta if they don’t want to battle traffic. Be aware that they are only available on weeknights, and weekends are generally not an option for scheduling - ESPECIALLY during wedding season. Jazmine had ordered a dress to wear for her session, but also came to the studio for a maternity fitting just in case what she had ordered online didn’t work. Good thing she did - the dress she ordered did not fit her and she didn’t like it. The good news: she loved our studio wardrobe and had chosen two dresses from it to wear! She also elected to add on hair and makeup services, and she worked with one of our HMUA team members, Hope . All the members of our HMUA team are amazing and very skilled. They’ll take your inspiration images and preferences into consideration and craft a gorgeous look for you that enhances your features and showcases the natural beauty that’s already there. Many of our clients, like Jazmine, prefer a very natural look, while others request a bit of drama and glam. Whatever your preference is: any of our team members can accommodate it! Jazmine has the most beautiful freckles across her nose, and I was thrilled to see she hadn’t covered them up when she arrived! Maternity sessions if you’re expecting your first child are really more like a couples sessions with a baby bump involved. This is the last time that you’ll have images with the two of you before your new addition arrives! A lot of my clients comment on how they want the “lovey dovey” images that they see from my other sessions, but they’re not sure how to do that. Worry no more - I handle that for you. We’re going to spend some time shooting and getting you comfortable in front of the camera at the beginning of our session. Once I see that your partner and you are relaxed and having fun, then we’ll bring on those snuggles. While I do place my clients into specific positions, the interaction that you see is all unique to each couple’s individual dynamic. I have yet to put two people who love each other extremely close together and not see any emotion or smiles! :) And don’t worry - telling your partner to drop to his knee and kiss your belly is definitely not part of my repertoire. I can’t wait to meet their sweet little baby sometime in the next month! Enjoy a few of my favorites from Jazmine & Chander’s maternity session in the gardens.